Constructed with stainless steel cutting heads for smooth operation and long service. 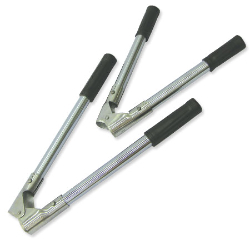 They are made from the highest grade of hardened steel used for dehorner heads. Cutting edges overlap to insure a complete cut. Handles are made of heavy tube steel for added tensile strength against larger horns. Polycoated grips reduce slippage and increase comfort.